Millions of Americans filling out their 2018 taxes will probably be surprised to learn that their refund will be less than expected or that they owe money to the Internal Revenue Service after years of receiving refunds. People have taken to social media, using the hashtag GOPTaxScam, to vent their anger. Many are blaming President Donald Trump and Republicans for their shrinking refund. Some on Twitter have even said they voted for Trump but won’t do so again after seeing their refund slashed. The uproar comes after Trump and congressional Republicans passed a major overhaul of the tax code in December 2017, the biggest legislative achievement of the president’s first year. While the vast majority of Americans did get a tax cut in 2018, refunds are a different matter. Some refunds have decreased because of the changes in the tax code made by the law, such as a new limit on property and local income tax deductions, and some have decreased because of how the IRS has altered withholding in paychecks. The 39-year-old is a manager at a Barnes & Noble Bookstore, and his wife works for the state government. They have two children. Prugh said he had no reason to think their tax situation would change this year, since he and his wife have lived in the same house for years and have received about the same pay in their jobs and have two kids. The average tax refund check is down 8 percent ($170) this year versus last, the IRS reported Friday, and the number of people receiving a refund has dropped by almost a quarter. An IRS spokesman said not to read much into this early data because it only reflects returns processed through Feb. 1, and the partial government shutdown caused some delays in processing filings. 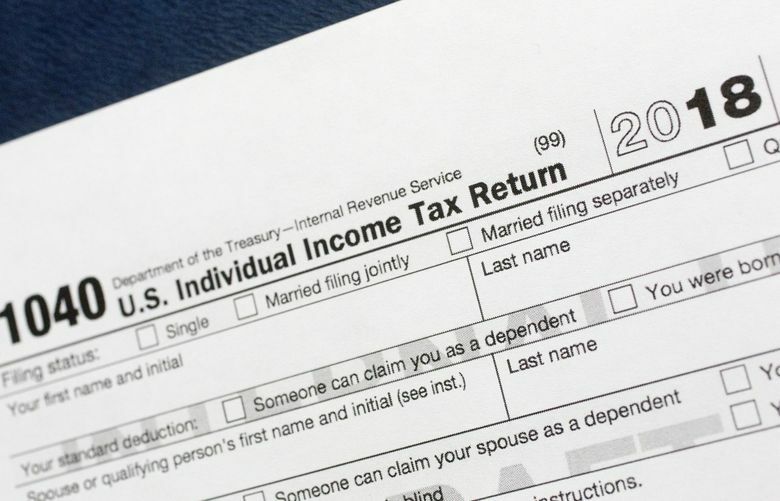 The early data can shift around a lot, tax experts say, but there’s reason to believe frustrations could rise as more Americans complete their tax returns. The Government Accountability Office warned last summer that the number of tax filers who receive refunds was likely to drop for the 2018 tax year and the number of filers who owe money would rise. The GAO pointed to an IRS estimate that about 4.6 million fewer filers would receive refunds this tax filing season. Another 4.6 million filers were likely to owe money who hadn’t had that experience in the past. There is no estimate for how many people will still receive a refund but a smaller one than before. Many Americans may confuse their small refund as a sign that they paid more in taxes as a result of the Tax Cuts and Jobs Act. Generally, that is not true. According to the Tax Policy Center, 80 percent of filers received a tax cut and about 5 percent wound up paying more in federal income taxes. The tax cuts showed up in fatter weekly or biweekly paychecks for most Americans, but few people noticed, according to polling. What happened to many families is they received a tax cut, but their refund is smaller this year because the IRS made major changes to the “withholding tables” – the amount the federal government recommends taking out of your paycheck for federal income taxes – because of the new tax law. The IRS was trying to set withholding levels so that more people would pay the correct amount of taxes, meaning they neither owe anything to the IRS at the end of the year nor receive a refund. “Getting a tax refund means that you gave the government an interest-free loan because you overpaid your taxes,” said Nicole Kaeding, director of Federal Projects at the Tax Foundation, a right-leaning think thank. But many Americans prefer refunds, even though personal finance experts say it’s not a wise idea to get one. “It’s a mystery why taxpayers seem to be comfortable – and even happy – with getting refund checks,” said Rosenberg. In recent years, about 75 percent of filers received refunds in recent years. Many Americans appear to like getting a refund because they feel that if they received an extra $20 to $40 a week, they would spend it. But when they get a one-time refund of $1,000 to $2,000, they put it toward paying off credit card debt, paying down a mortgage or saving for retirement. “I am really frustrated with my refund this year. I was expecting good chunk of change. I was going to put it toward buying a car,” said Sal Ramirez, a 20-year-old packaging designer in San Gabriel Valley, California. He earns $45,000 and said he received a refund last year of over $1,200 because he puts zero withholding on his W-4 form at work. Ramirez just got his refund from the IRS and it’s only $900 this year, likely because of changes to the withholding tables. He figures he’ll need to save a few more months for the car. The refund situation marks the latest potential trouble for Republicans over their tax bill. They argued it would be a political winner, but it has consistently polled poorly. Ramirez, who didn’t vote for Trump, couldn’t remember whether his total tax bill went up or down. He was just focused on his refund. In New Jersey, Prugh appeared to be affected by both factors affecting refunds this year: His overall tax bill is higher and his withholding looks a little lower. His family was affected by the new law’s $10,000 cap on state and local taxes (i.e. property taxes and state and local income taxes). He says in the past he normally deducted about twice that amount. He was also hit by the elimination of the ability to deduct mileage for work. The higher standard deduction under the new law did not counterbalance losing these other deductions.